I would need help / advise about my config. Some other gear (Analog Rytm, Minitaur) and more to come (SE-02…) played from the Prophet 6 keyboard when needed. I don’t need to use the Prophet 6 panel to control other gear, I want to tweak it only when I play the Prophet 6. I just want to send notes for now. I don’t need to automate the Prophet 6 controls either. I just want to use the Prophet 6 keyboard to send notes to my other gear. It might look like a very simple use case, but I am not able to make it work as expected. When local control is off on the Prophet 6, both keyboard and panel are off. It means that I have to send the parameters to the Pyramid and get them back in the Prophet. The only workaround that I have today is to set local control to on, and just lower the Prophet 6 volume when I play another track. This is too bad, I never thought that such a simple configuration would not be possible with my P6 and my Pyramid. I don’t want to enter a debate about « Prophet 6 should support keyboard only local control off » or « Pyramid should support NRPN », I am just asking if some of you could bring a better workaround than mine. I thought about this situation. I dont think there is an easy way out here. I am happily using the P12 module in my setup, local control does not change how the parameters function, only the program/bank select, but I understand this is not the case for you. But the best I can come up with is using a PC (or a iConnectMidi device for a standalone solution) to filter the MIDI messages from the P6 to two channels, one with notes etc. and the other with the NRPN parameter values. Then route only the NRPN back to the the P6 and have note and other data flow to the Pyramid, that then gets sent to the active track. Maybe some other smart folks here can think of a better solution. Using a keyboard which is being played in the set as my master controller has always caused endless problems. Midi clocking loops, stuck notes, and more. I really feel for you. Especially because this really just should work. Since midi must go OUT to the Pyramid, and return IN to the P6 you have a loop. Try setting the internal sync on the P6 to something other than midi, like USB or OFF if that’s available. Turn CC control on the P6 to internal, or even OFF if you can. Now for clock out settings, this needs to be turned OFF. Now you should only be getting a loop for the actual midi notes being channelized on the P6 channel. On the Pyramid try messing around with the midi input and output settings and see if maybe Midi Out (vs Midi Out + Thru) makes a difference? Take a look at Midi Echo as well. You may want to be sure this is OFF. I was having a frustrating loop in my efforts to add a fader controller to the start of the cain (OUT to the IN of the Pyramid) and it worked only with MIDI out + Thru turned on. But the sticking notes problem wasn’t ok, so I moved the controller further down the chain to just before the Octatrack (it is meant to control) and split the midi so midi comes for the Octotrack, and is split so that the midi out of the controller is merged with the midi input from the pyramid and it works well without doubling, or sticking. Great for me, but you’re struggling with a different issue. I hope looking at these settings, and finding a way to break the loop works out! MULTITRACK OFF will play notes and CC on the current track, regardless of the controller channel. MULTITRACK BANK X will play channel 01 events on TR01X, channel 02 events on TR02X, …channel 16 events on TR16X. CH01 to CH16 will play events of the selected channel on the current track. Other channels are always sent thru MIDI A output. Filters out all CC messages from your MIDI IN controller. Thanks guys for your time. This is great to benefit from such a cool community. 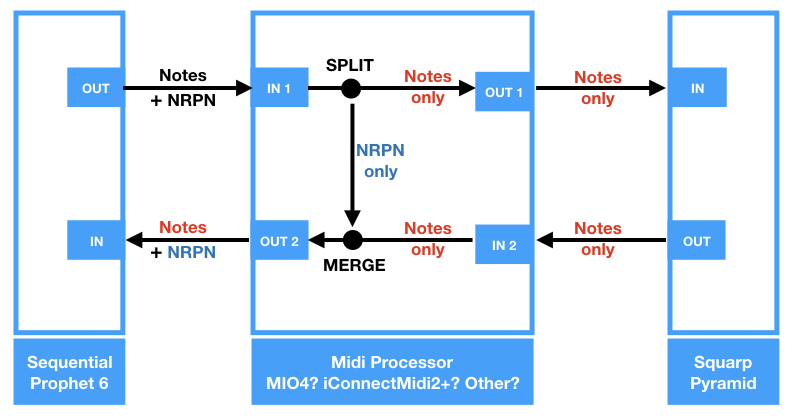 if parameters send/receive is set to NRPN, the midi flow seems to get messy and I get bugs. @Joseep : thanks for your idea. An iConnectMidi device sounds like the only solution, for now. If it can send back a correct NRPN flow to the Prophet, and send only notes to the Pyramid, it should work. You should/could first try with a PC (I have not tried anything like this myself). Connect the P6 MIDI over USB and connect the Pyramid to your computer. There are even some free MIDI software that should be able to do this. Another alternative would be to replace the Pyramid by a sequencer that supports NRPN correctly. I heard that the Cirklon does. There might be some others. There’s wisdom in trying this out with another sequencer. Attempting to accomplish the P6 as a controller with something which actually works would be a real coup, and a key to assisting Squarp trace down the matter and solve the problem. Have you tried this with another sequencer and had any luck? I’m in the same boat. I’ve had such a hard time using the P6 as a master keyboard, but I’m determined to figure it out since it’s such a beautiful keyboard, not to mention a lovely sounding synth… Seriously though, why is it such an impossible feat to find a midi controller with a decent keybed?! Anyhow, my solution for the time being is to use a volume pedal with the P6 and leave local control ON, but turn off CC rec on the pyramid. I set the Pyramid midi in to record on a specific midi channel so that when I want to record midi parts for another synth, I just turn the volume down on the P6 and record the new parts without the P6 playing. Yeah, it’s not ideal, but it’s better than having another full sized midi controller in my already very cramped space. I keep an Arturia keystep around for times that I really want to hear the P6 parts as I’m composing, but since I prefer to input midi in realtime as opposed to step mode, it’s just too tiny for what I’m after. An iConnectMidi device sounds like the only solution, for now. If it can send back a correct NRPN flow to the Prophet, and send only notes to the Pyramid, it should work. just reread this and thought I’d ask how this might be implemented. I’m using an iconnectaudio4+ in my setup (and I love it, although it’s not without its own problems) - but being that the Pyramid can’t really handle NRPN messages, how might the iCA4 actually help in this situation? Are you suggesting routing the P6 to software to handle NRPN? @palm : Thanks, it is good to hear that I am not alone. The pyramid would send the notes back to the midi device (through midi out A for instance), and they would finally go from the midi device to the P6 (needed, since local control would be off). So the midi device would need two midi in and two midi out. I tried to quickly check if the iConnectMidi2+ can do this filtering / routing, but this is not clear to me yet. I own a MIO4. It’s a beast of a MIDI processor, with only a couple of MIDI tools missing (stuff like channel bump which is almost attainable using the channel remap function). The iCM2+ uses the iConfig software to program it, so will have the same routing/filtering/channelising/CC remaping functionality as all their MIDI boxes. If you are not using iOS instruments, you might be better off getting the MIO2. The difference is the MIO range only does MIDI, where as the MIDI+ range can also pass audio via USB from an iOS device to a computer. Only thing the MIO2 doesn’t do that the MIO4 does is run a USB host (for non-iOS devices). I have 7 synths and controllers hooked into the MIDI network via USB, which freed-up a substantial amount of in’s and out’s on my two ancient MIDI patchbays. If I was to criticise the iContectivity boxes, it would be for their lack of front face control. I have a list of sysex and have toyed with the idea that I would program a controller to fire-off strings in real time to change setting, but really need a good amount of time off work to make that happen (come on December!). I’ve put my MIO4 behind a patchbay so I can have a little more flexibility with what is being sent to and from it. Hmm, I just quickly referenced the Pyramid manual, and it says that sysex received should be passed if the correct settings are made on the MIDI In page. So with that in mind, could you work with the P6 in local off and the Pyramid then sending the data back into the P6? @megamarkd I send sysex thru my iCM4+ almost every day. Even very huge sysex, bank data, software updates etc., without any issues. @joosep I mean actually changing settings within the MIO4 by sending it sysex strings in an effort to bypass using a computer or an iOS device to reroute it’s ports and change other functions. The time consuming bit is pawing through the sysex specs from iConnectivity to isolate the code for the functions I want to address. @megamarkd oh thats way above my paygrade. @megamarkd I tried to play with Pyramid midi in options, and P6 in local off, parameters send / receive as NRPN, hoping that even if the Pyramid is not supposed to manage NRPN, the midi flow would just go back to the P6 as it comes. At the beginning, it seems to work, and quickly I get bugs on the P6. I know that some other P6 users experienced the same thing. I did not inspect the midi flow coming out of the Pyramid in detail, but I suppose that something is going wrong. On DSI forum, several users have asked for a “Keyboard only local control off” option, that would solve everything. Too bad that as one of the “fathers of midi”, DSI does not implement this just because this is not part of the original midi spec. I’m grasping at straws here, but maybe this little box could be of help? anyone here ever used one before? I haven’t delved into NRPN or sysex, so I’m more or less a midi noob. It seems a little intimidating, but if it can get the P6 to work as a master controller with local control off, and perhaps fully mapping of all the knobs to other synths (I’ve mapped the knobs to my blofeld using cc, and it really speeds up the programming of that wonderful synth! ), that would be a game changer. I did not inspect the midi flow coming out of the Pyramid in detail, but I suppose that something is going wrong. There is a MIDI monitor on the Pyramid in settings/info that is very handy for checking what’s coming out of it. Too bad that as one of the “fathers of midi”, DSI does not implement this just because this is not part of the original midi spec. It’s one of my bugbears too. DSI and Roland, the creators of MIDI, have the worst MIDI implementation in the industry. I’ve thought about getting a MIDI Processor Plus, but for some reason keep not buying it. Not sure how many rules it can use at once, but it’d be a seriously large number to remap the P6’s NRPN’s to CC’s. @palm : the event processor plus has only one midi in and out, I think that two in and two out are needed for @joosep 's idea. I attach a schema, may be it can inspire someone. @megamarkd : my plan was not to remap anything, but configure parameter send / receive to NRPN on the P6, and say to the processor something like “just send back the NRPN to the Prophet, and the notes to the Pyramid”. But I don’t know anything about midi processors, I might be totally wrong.